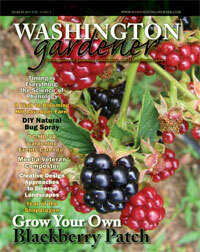 Washington Gardener Magazine is the publication for DC, MD, and VA area gardeners. Washington Gardener magazine, the publication for DC-area gardening enthusiasts, is hosting the 13th annual Washington Gardener Seed Exchange at Brookside Gardens and Green Spring Gardens. These seed swaps are in-person and face-to-face. You bring your extra seeds and swap them with other gardeners. 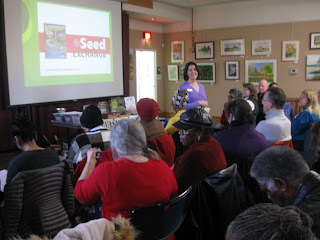 Everyone will leave with a bag full of seeds, new garden friends, and expert planting advice. We are holding a duo of Seed Exchanges one week apart on opposite sides of the Washington Beltway. We urge you to attend the one closest to you. One exchange will be held at Brookside Gardens, 1800 Glenallan Ave., Wheaton, MD. The other will be at Green Spring Gardens, 4603 Green Spring Road, Alexandria, VA.
Register online at WGSeedExchange-BrooksideG.brownpapertickets.com for the 1/27/18 event and WGSeedExchange-GreenSpringG.brownpapertickets.com for the 2/10/18 one. Registration fee is $20 per person. Friends of Brookside members, Friends of Green Spring members, and current Washington Gardener subscribers receive a discount rate of $15 per person. We strongly urge you to register in advance. There is a limited enrollment of 100 participants at each location! We also have a Garden Book and Seed Catalog Exchange table. Seed Exchange attendees are encouraged to bring their used or new garden books and seed catalogs to swap and share at this year’s event. We also ask you to bring your own water bottle or reusable mug and a home-made nametag. We will have a“best nametag” contest, so get crafty! Please package them in resealable plastic zipper or wax sandwich baggies. Put an average of 20 seeds per baggy — more for small seeds like lettuce, fewer for large seeds like acorns. Label each baggy with a white sticker (such as Avery standard 5160 address label sheets) giving all the information you have on the seeds. If known, include the plant's common and scientific names; its soil, sun, and watering needs; and, its origins — where and when you collected the seeds. If you don't know all the information, that is okay; just provide as much as you can. Yes, you can bring unused or opened commercial seed packs. What If You Don't Have Any Seeds to Swap? Come anyway! Even if you don’t have any seeds to trade, you are welcome to attend. We'll have plenty of extra seed contributions on hand and many attendees will be there just to learn, network, and prepare for next year's seed collecting. Expert speakers from the local gardening community will give short talks on seed collection and propagation tips. There will be ample time for individual Q&A throughout the program with the featured speakers, and invited experts as well. As you check in, staff will collect your seeds and place them at the appropriate seed category tables. You will be assigned a random seed swap number. There will be a short period for attendees to preview all the seeds brought in and available for swapping. You will be called in by your number to pick a seed pack from each of the category tables (if desired). After the initial seed swap is complete, attendees are free to take any of the left over seeds and to trade seeds with each other. Dividing of packets is encouraged and extra baggies with labels will be on hand for that purpose. Seed swap categories will include natives, edibles, herbs, exotics, annuals, perennials, and woodies (trees/shrubs). If you can pre-sort your seeds in advance into which of these seven major categories fits best, that would help us speed up the process on the swap day. Each attendee will receive a goodie bag at the seed swap. The bags include seeds, publications, and garden items donated by our sponsors. In addition, we have some incredible door prizes to give away especially for area gardeners. If your organization would like to contribute seeds or garden-related products for the goodie bags and door prizes, contact Kathy Jentz at 301.588.6894 by January 22. Extra seeds from the swap are donated to local, nonprofit gardening groups. A donation from the event proceeds has been made to the Save Our Monarchs Foundation. GARDEN PHOTO CONTEST KICKS OFF! 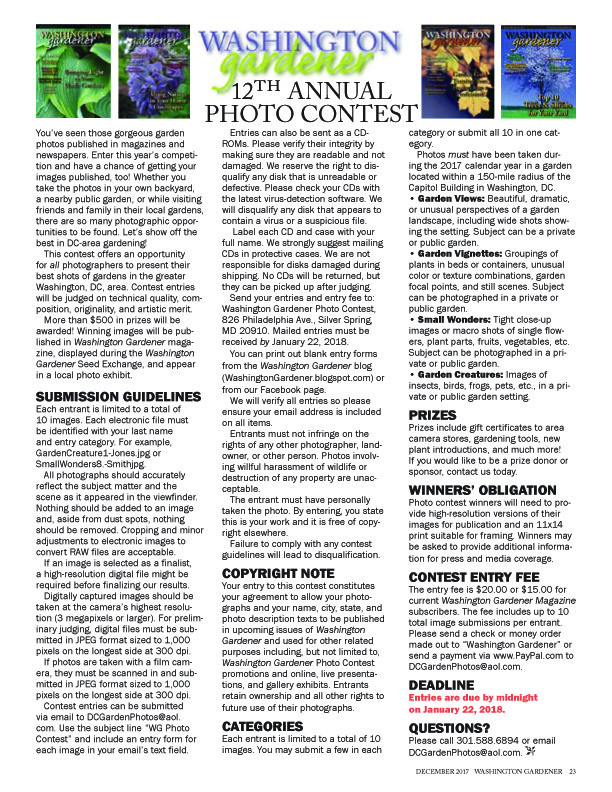 THE 12TH ANNUAL WASHINGTON GARDENER MAGAZINE PHOTO CONTEST KICKS OFF NOW! TIME TO START SORTING AND PICKING OUT YOUR BEST 2017 GARDEN SHOTS. THE ENTRY PERIOD IS JANUARY 1-22, 2018. Note that eligible entries must have been taken in the 2017 calendar year in a garden setting within 150-mile radius of Washington, DC. Remember that garden photos need not all be taken during the first week of May nor should they all be tight close-ups of a red rose. Look for the unusual and for beauty in the off-season too. Our judges give equal weight to the following criteria when evaluating the entries: technical merit, composition, impact, and creativity. Anyone can enter: professional or amateur, adult or student, local area gardener or visiting DC tourist. Past winners have included teenagers entering their first-ever photo contest and home gardeners trying out their new digital cameras. Our next Grand Prize Winner could be YOU! 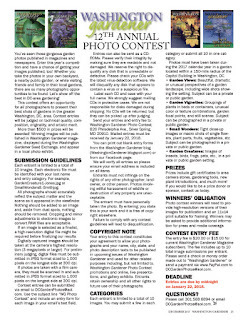 For any contest inquiries, contact DCGardenPhotos@aol.com. *A PDF of the rules is available on request, if the JPG is not legible for you. The December 2017 issue of Washington Gardener Magazine is now out. Note that any submissions, event listings, and advertisements for the January 2018 issue are due by January 10. Reviewer Nicole Reisinger, said: "Leon’s styling tips and advice are plainly written; her simple guidance is inspirational and makes creating a calmer and brighter space achievable. In addition to her styling tips and plant gallery, Leon’s care guide to help your cacti and succulents thrive is extremely thoughtful and well-informed. From scorching, disfiguration, discoloration, wrinkling, and overwatering, Leon covers all the bases on what to and what not to do. The book itself is attractive, with an abundance of cacti and succulents engulfing the cover. Leon’s beautiful photography makes her work feel like more of a coffee table book than a how-to guide. Don’t judge a book by its cover, though, because the knowledge and information tucked alongside each picture is just as expert. Prick is a perfect holiday gift for all plant lovers who want a burst of style." Reviewer Jim Dronenburg said: "The book, published in two centuries’ retrospect, is much more than pretty pictures, although you could certainly buy it for the prints alone, and it certainly is a coffee-table-sized book. But the first part (14 pages) is text and pictures related to the subject, first describing Banks, his staff, the ship, crew, captain, and the voyage from start to finish. For anyone with any interest in botany or history, it is a fascinating read. The second part (pages 21-295) is the plates themselves. Each has a description with it-: Latin genus and species, native name, English common name, a description of the plant and where it grows, quotes from the various journals of the voyage where applicable, uses of the plant, and a quick run-through of the plant’s botanic name and any changes. Very well annotated, too. This is expensive, but a great present to yourself. It is a great present for any gardener you know. I myself intend to get this book." Reviewer Erica H. Smith said: "Every once in a while, a gardening book comes along that isn’t merely another nice resource I’ll point out to others, but that feels like it was written just for me. Veggie Garden Remix is one of these. It’s all about the weird and fascinating food plants I like to try in my garden—and unlike so many of the articles and lectures that have claimed they’d introduce me to something new, actually describes quite a few I haven’t grown! It’s also my favorite type of gardening book in that it tells a story about a personal journey, in this case Niki Jabbour’s decision to make her garden into an international wonderland. Her journey began after her Lebanese mother-in-law pointed out that the snake gourds intended for Halloween decoration were in fact edible and known to her as cucuzzi. I love that Jabbour gets this and writes with equal fondness of all the vegetables coming out of her garden and appearing in the pages of this lovely book. This book is a great addition to the gardening library of adventurous and timid gardeners alike; it tells the story of how trying something new isn’t scary, even if it does make a good Halloween decoration. Even those more experienced in growing the unusual may find surprises here—I’ll be browsing again when it’s time to make choices for next year’s garden." Reviewer Uyen Nguyen said: "A New Garden Ethic is very timely. As the threat of climate change looms and more agricultural spaces pop up in urban areas, author Benjamin Vogt asks humans to, in short, be humane. He asks us to reconsider the way we garden; more specifically, to see the value in gardens beyond their physical beauty. Not only do gardens serve as sanctuaries for its owners, but did you ever think about all the organisms that live and thrive in your garden? We should not view the small animals that inhabit our gardens as pests. If you see “fat yellow, black, and white-striped caterpillars” chewing on and destroying your “ten-dollar plant,” you’d probably want to grab pesticide and spray it on those pests. But you should also keep in mind that those same “pests” will grow into beautiful Monarch butterflies, which signifies you have a healthy garden. In just 163 pages, Vogt is able to fit in so much passion—supported by extensive research—about reconnecting with nature through ethical gardening. His vivid prose makes the narrative very easy to follow and keeps you invested in his persuasive argument. Anyone who gardens, either at home or professionally, should give A New Garden Ethic a read. This is a cathartic piece of literature that goes beyond telling people how to garden; rather, it provides a fresh take on the importance and ecological benefit in gardening ethically and sustainably. As a non-gardener, this book makes me want to start my very own garden so that I can contribute to the environment." Reviewer Maeve Dunigan said: "In Glorious Shade, Jenny Rose Carey takes the reader on a beautiful adventure through the shady areas where breathtaking gardens grow. With detailed descriptions and stunning photos, the author is able to teach the nuances of this type of gardening while providing plenty of context and personal anecdotes along the way. Carey does not limit herself to England and Pennsylvania—photos of gardens span from those in Wyoming, to Illinois, to Maine, and even one local area garden. Ladew Topiary Gardens in Monkton, MD, is featured as having purposeful paths and well-informed design in the section of the book that provides inspiration for garden arrangements and schemes. Save for a select few, Carey photographed almost every landscape seen in the book. Her photo skills rival her writing, as each image perfectly complements the text alongside it. Images in a book such as this are of the utmost importance, since it can be hard to envision the spaces only through description. Each photo, in bright, stunning color, is a lesson in successful shade gardening. Overall, Jenny Rose Carey’s Glorious Shade is an overwhelming success. The book, packed with pictures and tips, can soothe trepidations anyone may have about the seemingly difficult act of starting a garden in a shady area." Reviewer Nicole Reisinger said: "The Naturalist’s Notebook is a charming, yet practical, guide that gives any lover of the outdoors the chance to develop their own insights about the world around them. The book highlights plant life, insects, birds, and a range of other topics to help the reader establish new habits and techniques. Throughout the book, Wheelwright shares anecdotes about his experiences as a naturalist. This personal approach gives readers an example to emulate and some ideas to consider while conducting their own research. Heinrich’s beautiful illustrations capture the beauty of the natural world and inspire the reader to do the same. There is even a glossary for readers to create their personal abbreviations so they can keep track of their notes. This charming book with its gilt-edged pages and classic illustrations would make a great holiday gift for any nature lover or outdoor enthusiast." Big Dreams is organized into four sections (Visualize, Achieve, Maintain, and Enjoy) as steps for helping troubled gardeners complete a project from start to finish. Pleasantly designed, Willburn’s book includes a ton of personal experience, photos, and useful information that beginner or intermediate gardeners might not think about. Profiles of small space and limited-resource gardens are sprinkled throughout the book, complete with pictures and advice to recreate what is shown. Big Dreams is the perfect addition to your gardening library." Reviewer Jamie Moore said: "The Humane Gardener embraces “compassionate landscaping,” a method of gardening that takes into consideration the needs of wildlife, whose habitat is being increasingly replaced by deserts of concrete and turf grass. The book is very readable, with instructive chapters interspersed with profiles of scientists, activists, naturalists, and gardeners who have turned their yards into beautiful havens for both themselves and wildlife. Photographs are sprinkled liberally throughout the text. The principles described in the book appear straightforward and easy to apply. I truly enjoyed this book and am looking forward to creating a more wildlife-friendly yard. I have become more aware of the corruption of nature in my suburban neighborhood. Instead of birdsong, the most frequent sounds I hear are lawn mowers and leaf blowers. For the past few years, I have been working to replace my lawn with plants that attract beneficial insects. The Humane Gardener has showed me many more ways I can repair the balance of nature in my yard, and I hope to inspire my neighbors to do the same." Reviewer Erica H. Smith said: "Those of us who love monarch butterflies are eager to share their story and to learn more about it ourselves. This book is a great way to do that. Only 160 pages long, an afternoon’s reading, it nevertheless covers monarchs in plenty of detail, including life cycle, migration, threats to survival, and ways to help these fascinating creatures escape extinction. This is an attractive book, chock-full of information, that would be useful to anyone from a teen-aged student to a veteran gardener. If you love monarch butterflies or want to learn more about them, check it out!" Reviewer Teresa Speight said: "This is a manual, not a book, on how to assess the space you have and create the larger vision you desire. Taking the reader from the options of where you can garden and why, to what types of spaces one can grow, is amazing. There is even a chapter to encourage the reader to expand the possibilities by thinking outside the box. The authors urge us to consider things that might make the available space more appealing, like lighting, art, water, or exotic plant material. The chapter on Projects was simply amazing—from descriptions that included everything you would need to complete a piece to a suggested plant list. My favorite was the succulent picture frame. A little mesh, a frame, some screws, and, of course, succulent plants, voila! This is a idea that is great for the backyard terrace wall and even as a gift. Big Ideas for Small Spaces also has a resourceful section on how to use certain plants, how to choose plants, and a listing of a few common problems you might encounter and how to solve them. If you are looking for a manual on innovative ways to work with the space you have available and not break the bank, this is a must-read book. I would also suggest this book as great gift for anyone who is looking to make gardening just a bit more rewarding no matter what kind of space you have available." This year, I thought I'd share the garden products I use almost every day. These are the tried-and-true work tools that make my garden grow, save my back from breaking, and generally make life a little easier. (They are linked to Amazon, so if you click on them and order any, I get a couple pennies added to my account.) Tomorrow I will share a "Top 10 Garden Books of the Year" from our magazine's reviewers as I think those would make terrific gift choices as well. Happy Holidays all! I was so sad to hear of the passing of a great plantsman and herbalist this week. Jim Duke is one of those people who touch so many lives that is impossible to calculate the true cost of his loss to our gardening community. Here is the interview I conducted with him that appeared in the Winter 2010-11 magazine issue of Washington Gardener Magazine. James “Jim” A. Duke, Ph.D, is a botanist and famed herbalist. His numerous publications on botanical medicine include the CRC Handbook of Medicinal Herbs. Many know him for developing the Phytochemical and Ethnobotanical Databases at the USDA. I first heard raves about Dr. Duke’s herbal garden from Master Gardener friends who had been blessed to visit it in person. They were tickled pink that he wrote poems, which he set to music, about herbs, their proper and common names, and some of their properties. Next, I began to hear tales from my herbalist friends about a great, ageless man who was the very font of plant medicine wisdom and lived right in our own community. Then came the challenge: How do you write about someone who’s been profiled by everyone from The New York Times to People Magazine? Well, I reached out to him and let him say it in his own words. Tell us about you and your background. Are you native to DC? While born and raised in the deep south, Alabama, my first seven years, my formative years in Carolina, I have lived over half my 81 years here in Maryland. That includes 40 years here at 8210 Murphy Road in Fulton, MD, in Howard County. It is a lovely six-acre farmette with about three acres of woodland and three open acres where two small streamlets flow together about a half mile from the Lower Patuxent Reservoir. How did you start the Green Farmacy Garden? I retired from the USDA a few years early to write my book, The Green Pharmacy (TGP). That was a wise decision. The book was one of Rodale’s better sellers, selling over a million copies and leading to five derivative books, some of them having been translated into about 10 languages. The last chapter of that initial book is rather autobiographical. And I repeat some of that here. The book sold so well that I saw the opportunity to create the Green Pharmacy Garden (GPG), rather patterned after the book. There are some 80 plots in 4 long terraces, each named after an ailment, and including the best available herbs for those ailments. Even today, I am medicating a cough with garlic from the garden and candied ginger. And I tolerate mini-tours when it is sunny and above freezing. The garden was laid out in 1998, by John Snitzer and Kerrie Kyde as landscapers who mixed some of my ideas and theirs, and got the garden off to a good start. Gradually they turned over the garden management to the first director, Holly Vogel. Early this decade, Holly co-directed the garden with Helen Metzman, biologist, herbalist, and graduate of the MSc Herbal Medicine program at the Tai Sophia Institute in Columbia, MD. The Institutes is about a mile as the crow flies from the Institute. Early in the 2000s, Helen assumed the directorship. Helen is very talented and creative and she really keeps the garden running. I would be lost without her. 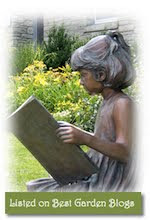 In 2005, Peggy (Mrs. Duke) and I obligated the garden property to the Tai Sophia Institute in a Life Estate Arrangement. Conveniently, Peggy is both a botanist and illustrator and she illustrated TGP. Meanwhile, Tai herbal students attend hands-on classes in the garden, studying and observing some of the many plants in and around the garden in at least three of the four seasons. We sometimes call the garden the Tai South Campus. The Institute web site is Tai.edu; the garden is also featured online at GreenPharmacy.com. There is no typical day. Almost every day a new challenge arises, and these are admirably managed by director Helen; would you believe spearing a mother black snake while pitching mulch; huge spurting leaks in the drip irrigation system; floods washing out recently applied mulch; 40 inches of snow last year, more than I have ever seen, our beautiful rosemary surviving wrapped in burlap, and under an igloo created by a beach umbrella, but probably killed by this atypically cold December closing 2010; the floral clock plants opening according to their, not my, schedule; a summer windstorm littering the garden with summer green leaves on the day of an important tour; an infestation of cicada-killers scaring all the hymenopteraphobes on a summer morning; a dead three-footed deer in the middle of the garden, almost too heavy to lift out of the garden without a wheelbarrow. etc., etc. Normal days in season would include the director and a volunteer or two, or an intern tackling different chores, some routine, with me crippling up rapidly due to spinal scoliosis, spondylosis, and stenosis, spending less time in the garden and writing at the computer, especially working on a database. But at noon, we join in the gazebo for a vegetarian soup or such, with some fresh veggies and culinaries from the garden, some canned or dried, fleshed out with the usual starters like cabbage, carrots, garlic, onions, potatoes, from the kitchen cabinet; sometimes serenaded with herbal country music from the HerbalBum. And Thursdays, the weekly volunteers’ open house, we close with flower-watching (vespertine opening of such flowers as Oenothera or Datura), herbal snacks, live country music, sometimes with great classical guitarist, Bruce Casteel, and the herbal folks discussing tall herbal tales and aching herbal tails. What mistakes and triumphs have you encountered in herb-growing? Most of the mistakes have been mine, due to my impatient hastiness, and the triumphs thanks to Helen and her helpers, blessed be they: getting the flowering passionflower to shade the Banisteriopsis; keeping the ginseng alive in its cupola with a wire cage; getting rid of two of the three kudzu; getting the castor bean to reseed itself; pruning the spiny aralia; manually and organically battling the plagues; etc. What advice would you give to beginners/amateur gardeners in the greater DC area? Depends on what I think of the person’s aptitude. Don’t do it if you think it is easy! Think small! Do not anticipate making big bucks! Visit the herb gardens at the National Arboretum. Visit the National Botanical Garden. Visit Brookside Gardens. Visit all the major gardens before you launch your own. Do not expect tranquility; rather, disasters due to garden visitors like deer, groundhogs, rabbits, raccoons, chipmunks for the greenery and birds for the fruits and seeds, and snakes for the birds, eggs, and frogs, and the biting insect pests that sometimes haunt the organic garden, a United Plant Savers preserve. We have to cage many of the rare specimens, like ginseng, goldthread, schisandra, and many of the medicinal vegetables in the cabbage family. What plants are your favorite to use in the greater DC area? I must confess that, in many cases, my successes turn out to be invasive weeds whose allelochemicals also serve as both antifeedant and medicinal. Aromatic mints are often too easy and invasive, and seem to be ignored by most of our herbivores. While I do not recommend them to discriminating gardeners, I like the idea of aroma-theme gardens. The herbivores rarely plague the highly aromatic plants. And, if I were to dedicate a second garden, easier to manage, it would be of highly aromatic species. It could provide medicinal teas almost all year round, not just the evergreen ones, but the perennial twigs provide aromatic teas all year. The mint family, which includes catnip and lavender, is loaded with antioxidants and choline-preserving chemicals probably safer than and as effective as Aricept for Alzheimer’s. And I am rather proud of my various Hypericums, including the invasive weed Hypericum perforatum, which was shown superior to Zoloft as an antidepressant. To that I add the Biblical saffron, proven better than the antidepressant imiprimine; the Biblical turmeric, with proven antidepressant activity; and the Biblical walnut of Solomon’s garden, one of the richest sources of serotonin. And don’t forget the Biblical pomegranate, which overwinters but has not yet borne fruit for me. I have not counted therm, but I have dozens of species mentioned in the Bible. I have had Sunday School classes focusing on such Biblical medicinals. What herbs do you think grow best in the greater DC area? We have about 300 species in the garden, and most of the temperate herbaceous annuals and perennials are easy to grow. On the other hand, we have dozens of tropical individuals squeezed into our Noah’s Ark of a greenhouse, including many tropical spices .like bay (subtropical), cardamom, cinnamon, ginger, turmeric, zedoary. They are a challenge in the winter. We would lose them all if our electricity were off for a day, so I shudder each time the electricity flickers. We have a pretty good track record here in Howard County. And we survived that blitzkrieg 40-inch Snowmageddon early this year (2010) and so far this winter with no outage. Maybe one of your garden readers near me ,with a four-wheeler could dig out this medicinal plant doctor (PhD) — me — and bring a portable generator to rescue me and my tropicals. Let me hear from any of your good readers on whom I might call for rescue in case of outage. Will guarantee him or her and a small circle of gardening friends a free tour of the garden in warmer weather. Conversely, what plants and herb varieties would you advise others to avoid growing in our area? Admitting that lazy medicinal gardeners like me prefer dealing with invasives, I would urge that careless gardeners avoid most hardy mints, most true bamboos, and Dang Gui (Angelica), Goutweed (Aegopodium), Hot Tuna (Houttuynia), Japanese Honeysuckle (Lonicera), Kudzu (Pueraria), Mexican Bamboo (Polygonum), Mugwort (Artemisia), Plume Poppy (Macleaya), Stinging Nettle (Urtica, unless you love it as food and medicine; we do), and Trifoliate Orange (Poncirus). There are many, many more. I have merely named some that are particularly bad for one reason or another. The chemicals that make them weedy are often responsible for their distastefulness and their medicinal activities. What are your favorite plant purchasing sources? When I am in a hurry, I race to local garden centers. I got the Behnke habit when I was working in Beltsville, MD. But director Helen cautiously orders in winter and she seeds many things herself. Richo is the first we check when trying to get new material of rare herbs proving to help one of our 80 indications. And, if I hit the Lotto, I will be working on a new book, Gaps in the Green Pharmacy Garden, and a new garden to cover many types of cancers and many other ailments that were omitted, accidentally or on purpose, in the first The Green Pharmacy (Rodale, 1997). Is the Green Farmacy Garden open to visitors and are you selling your plants? We welcome garden groups and have had several tours by Master Gardener groups; also FDA, NIH, acupuncture mentor groups, aromatherapy groups, area biology classes, etc. We are open from April through October, and require a minimum of $300 for the first 1.5-hour tour of up to 20 people, no more than 8 cars. We do not normally list plants for sale, but like to trade, or give volunteers some starts from the garden. Like many private and public gardens, we are short on cash. We can arrange special tours for special supportive groups, Music in the Green Pharmacy Garden, with an hour of excellent classical guitarist, and/or my herbal guitar-accompanied doggerel; two hours of your choice, between dawn and dusk. This requires a $2,000 donation to the garden. What do you do when it is not the growing season? I spend too many hours at my computer and too little time outdoors. I spent several hours on Christmas Eve, my son’s birthday, compiling several pages of data on the culinary costmary, Tanacetum balsamita, which will go into the culinary and spice database of some 250 spice-like medicinal plants in my collection of 2,750 medicinal plants. When this database is completed, it will contain many more data and species than my very useful USDA phytochemical database, which is online free at http://www.ars-grin.gov/duke. Once completed, this database will tell researchers which of the 2,750 medicinal plants in the database have the best evidence for alleviating, attenuating, “curing,” or preventing nearly 1,000 indications, including dozens of cancers. By FDA dictate, James A. Duke, PhD (Botany) cannot prescribe, much less prescribe unapproved medicines, even if they are well-known as “generally recognized as safe” or GRAS herbs, spices, and vegetables. But the database will enable an enlightened FDA to see which of the herbs have the best evidence for a given indication. Then the FDA will have a pretty good idea of which herbs should be clinically compared with which dangerous but FDA-approved pharmaceuticals so that an enlightened public will finally see which is better for their health, the garden or Big Pharma. Most of my wintertime is spent accumulating such data. But for the last couple days, I alternated compiling for the database, with working on a new chapter and/or plot for the New Green Pharmacy book. 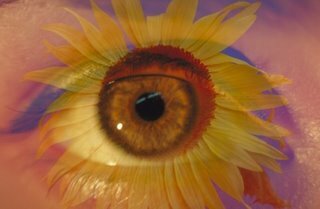 I was recently working up the food farmacy approaches to Retinitis pigmentosa. At age 81, I doubt I will hit the lottery and start a second GPG for “orphan ailments” not covered in TGP. But I predict that an enlightened FDA will soon save the American public from the pharmaceutical poisons with safer, gentler medicine from the gardens, food “farmacy” from the veggie gardens, herbal medicine from the herb gardens, spice medicines from the spice gardens, aromatherapeutics from aroma gardens; even mint medicine from mint gardens, and, yes, weed medicines from the invasives that plague our gardens. Step into a magical winter wonderland illuminated with more than one million dazzling colorful lights shaped into hand-crafted, original art forms of flowers, animals and other natural elements. Stroll from garden to garden enjoying twinkling tree forms, sparkling fountains, and whimsical winter scenes. The Garden of Lights celebrates its 19th season as a Baltimore/Washington, DC area family holiday tradition. The night wouldn’t be complete without a visit inside the Conservatory to enjoy watching G-Scale model trains wind through a seasonal landscape. Afterward, warm up inside the Visitors Center while you sip hot cocoa and listen to one of the nightly musical performances. To enter to win a pass that admits one car-load of guests to the Garden of Lights, send an email to WashingtonGardener@rcn.com by 5pm on Friday, December 22, with “Lights Show” in the subject line and in the body of the email tell us your new year's resolution for your garden. Please also include your full name and mailing address. The pass winners will be announced and notified by December 24. Congratulations to all and enjoy the light display! Washington Gardener Magazine Received the 2018 GWA Media Awards Silver Medal of Achievement for Garden Communications. Washington Gardener is dedicated to treading lightly on this planet. Because we are committed to doing all we can to protect and preserve the environment, we've adopted business practices to make our footprint as small as possible. We source 100% windpower. All of our partners and suppliers are local (DC-area) businesses. When we do print our publications, we use vegetable-based inks and papers with recycled content. Washington Gardener is proud to named a Best Garden Blog. (c) Washington Gardener Magazine. All rights reserved.. Simple theme. Theme images by molotovcoketail. Powered by Blogger.